Reconstructing Jackson by Holly Bush has a brand new cover designed by yours truly! Holly has been very successful with her Prairie Romance series with sepia-toned covers, but she felt it was time to offer them in print and bring them to life in full color. We previously revamped the covers of Romancing Olive and Train Station Bride, and Reconstructing Jackson completes the sepia-to-color conversion. 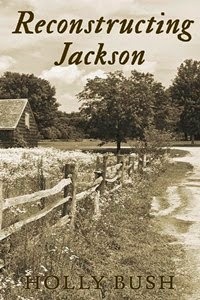 1867 . . . Southern lawyer and Civil War veteran Reed Jackson returns to his family’s plantation in a wheelchair. His father deems him unfit and deeds the Jackson holdings, including his intended bride, to a younger brother. Angry and bitter, Reed moves west to Fenton, Missouri, home to a cousin with a successful business, intending to start over. Belle Richards, a dirt poor farm girl aching to learn how to read, cleans, cooks, and holds together her family’s meager property. A violent brother and a drunken father plot to marry her off and gain a new horse in the bargain. But Belle’s got other plans and risks her life to reach them. Reconstructing Jackson is available in ebook and paperback on Amazon, Barnes & Noble, and Smashwords! Check out Holly's website for the scoop on all of her books.